The Neighborhood Council is a unique organization currently composed of 113 democratically organized neighborhood associations. Groups of presidents from these associations meet with the Mayor and his staff throughout the year in regularly scheduled sessions to share information, report concerns and make suggestions that will improve the quality of life for residents and the city as a whole. There are currently six sectors of neighborhood presidents in geographically connected areas of the city. There are two sectors downtown (includes Daniel Island), three sectors in West Ashley, and one sector comprising James and Johns Islands. Neighborhoods interested in applying for membership in the Neighborhood Council must be organized with a set of by-laws and have precise, unambiguous geographic boundaries. An application is available to be completed along with a petition that twenty residents must sign. Applications are reviewed and approved for status by the Neighborhood Commission annually. See a complete PDF map of the Neighborhood Council. 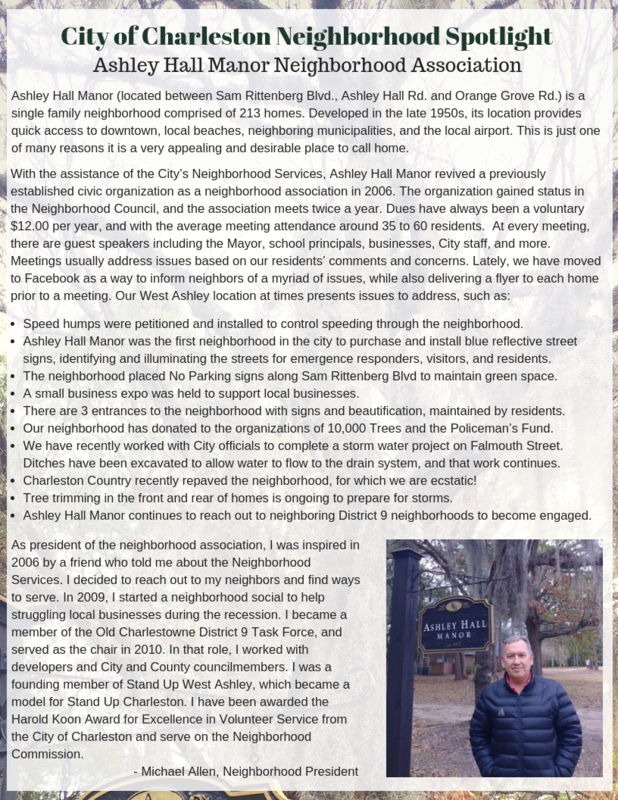 Enter your address to find your Neighborhood Association. The Neighborhood Commission consists of twelve citizens from each district appointed by City Councilmembers and one at-large appointment made by the Mayor. The Commission meets twice a year in the fall to approve applications by neighborhoods interested in joining the Neighborhood Council. The Commission also reviews submissions for the annual Harold Koon Volunteer of the Year Award and selects the annual recipient.